Les premiers pas d'un enfant en chaussettes sur parquet glissant ! Attention les chevilles ! I think the last time we saw the little Prince and Princess, they had their adorable 'bald' heads, so it is nice to see they are standing with assistance and their hair is growing. 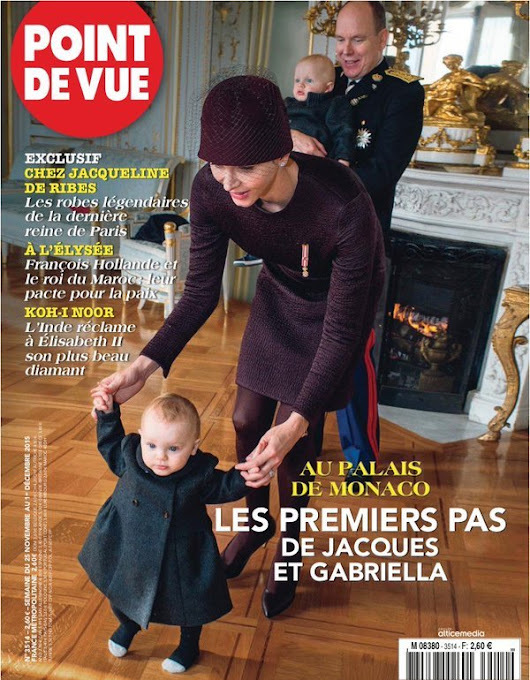 I like how Prince Albert and Princess Charlene are allowing the public to see the children every few months. Some royals seem to want to keep their children from public view for long periods of time. This may not work for the best in the long run. I think Albert and Charlene have hit the right note. I agree with you. .. The British "royals" are mobbed the moment they put their nose out. That would be frightening to very young children and babies. I remember prince George's photo when his father took him to the hospital to see his newborn sister. The kid was not 2 years old and looked a little scared. You might note that in Monaco, the pictures were taken inside the palace, on the occasion of the national day, with a photo op scheduled. wat een schattige kindjes,en dat wij er zo van kunnen genieten!! !